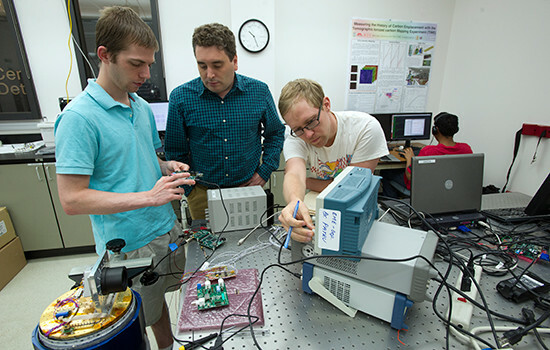 A team of engineering undergraduates at the Rochester Institute of Technology (RIT) are reaching for those stars with a new research project for NASA: designing a “compass” for rockets using a new type of detector technology. What these engineers are working to design, build and eventually deploy is a star-tracking system for rocket navigation. Intended to fly on a NASA technology demonstration mission later in the year, the system combines telescope and camera components that will orient rocket payloads based on images of the visible star field. Star-tracking systems have been used for satellite, rocket and other spacecraft navigation for quite some time. What sets this project apart is revealed in its name: the Cryogenic Star Tracking Attitude Regulation System (CSTARS). The RIT students are experimenting with detectors made of metal-oxide semiconductors (CMOS), which show promise to operate well even at temperatures as cold as that of liquid nitrogen, minus 320 degrees Fahrenheit. Being able to operate at super-low temperatures is important for space systems, as the cryogenic temperatures reduce dark current in the sensors and increase instrument sensitivity. The traditional technology used in astronomical imagine systems is often similar to that found in consumer electronics – charge-coupled detectors (CCDs) – which become inoperable at very cold temperatures. The prototype from RIT is a move toward developing fully cryogenic detectors that could improve the sensitivity of NASA’s future deep-space cameras. The star tracker will fly as part of a technology demonstration payload on a suborbital sounding rocket launching from NASA’s Wallops Flight Facility in December of this year. The project at RIT is funded with a $200,000 grant from NASA’s Undergraduate Student Instrument Project (USIP) Flight Research Opportunity program, which provides research grants specifically to undergraduate-led teams. The program is geared to supporting the development of professional engineering skills in undergraduate engineering students. It also gives these students the valuable experience that comes from creating experiments directly relevant to NASA missions. The students on the team hail from a range of engineering disciplines. Members include electrical, mechanical and computer engineering undergraduates. They are also working with team members from other departments at RIT, including physics, computational mathematics and business. This type of interdisciplinary team environment enhances the experience and skills these students learn by creating an experience the same as how teams in future professional projects will operate. Between the high-level technical skills students develop through these kinds of programs, as well as the leadership and teamwork skills that come from collaborative projects, these engineers will have great experiences to bring with them into graduate school or their future career. To learn more about NASA’s and the Rochester Institute of Technology’s engineering projects, visit the NASA Wallops Flight Facility or RIT websites.